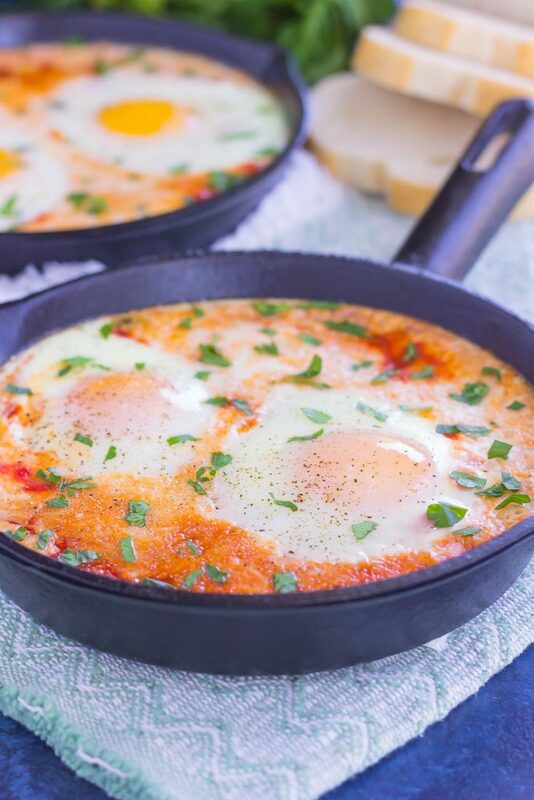 These Marinara Baked Eggs make an easy and hearty meal for busy mornings. Perfect alongside toast, garlic bread, or on its own, this dish is sure to be a favorite all year long! 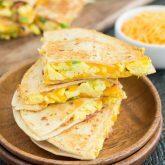 Breakfast foods are one of my favorite recipe categories to test, hands down. Mainly because it usually involves eggs, and I love eggs in just about any form. Especially when you get that runny yolk that just seems to make your dish even prettier. But one of my faults when testing recipes is the cooking or baking time. For some reason, I always overestimate on time, whether that be with granola, brownies, cookies, or even eggs. It took me a long time to perfect this Banana Bread Granola because I kept burning it, and I often overcooked these brownies until I got the texture just right. And baked eggs? Those require some skill and patience, too. After all, you can’t cook them too long, otherwise the yolk starts to harden. But, if you don’t cook them long enough, you end up with under cooked, slightly raw whites. But when the idea for these Marinara Baked Eggs sprung to life, I knew I had to get my egg baking skills just right. After all, the runny yolk is definitely needed. 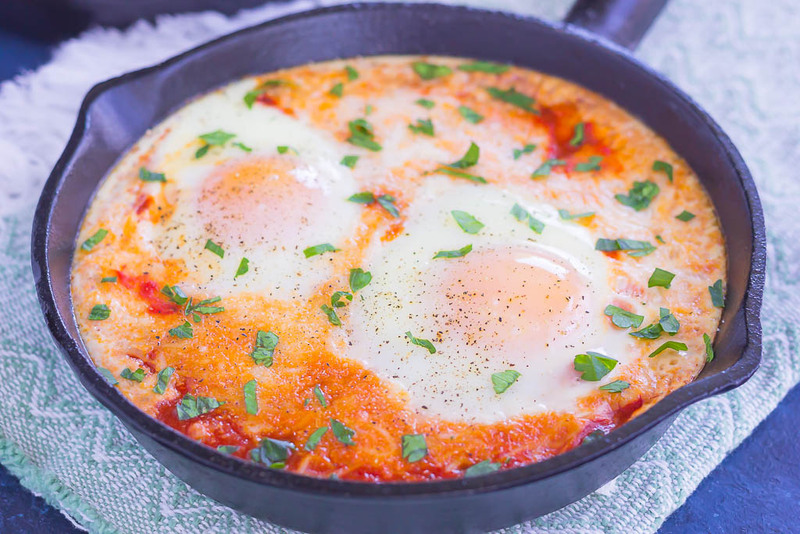 If you’ve never had marinara sauce topped with eggs and then baked until perfection, you’re totally missing out. But that’s ok, because now you’ve got the perfect recipe to test out. And I know baked eggs in marinara sauce isn’t necessarily a new concept, but for me, it was a recipe on my bucket to try for a long time. And, of course, I put my own touches on it. 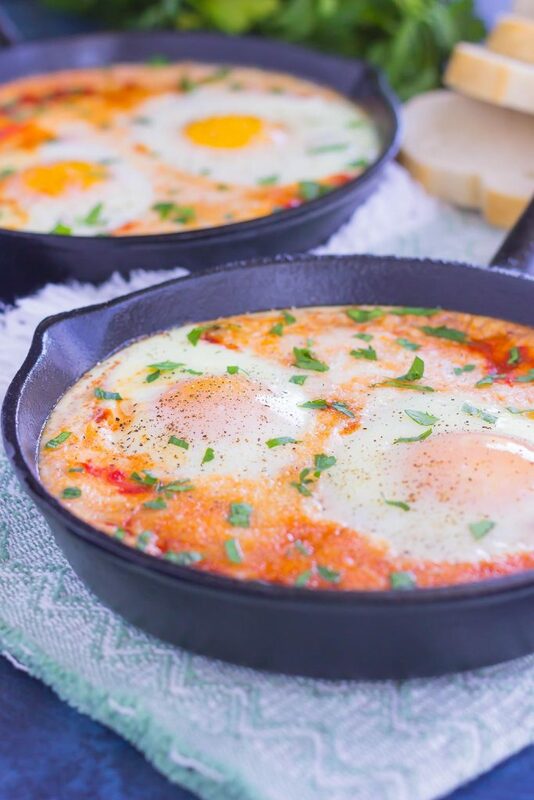 Filled with a hint of garlic, two types of cheese and eggs, these Marinara Baked Eggs are packed with flavor and takes just minutes to make. It also works for breakfast, lunch, or dinner. See? A multi-tasking meal that’s ready whenever you are! Now lets talk about those baked eggs. Oh are they good! 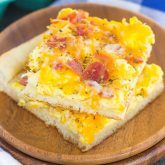 The eggs get nestled into the marinara sauce and cheeses, and then is cooked in the oven until the whites are just set, but the yolk is still golden and runny. And when you dig in with your form (or a slice of toasty bread) that yolk just oozes out. Perfection, my friends! So what are you waiting for? 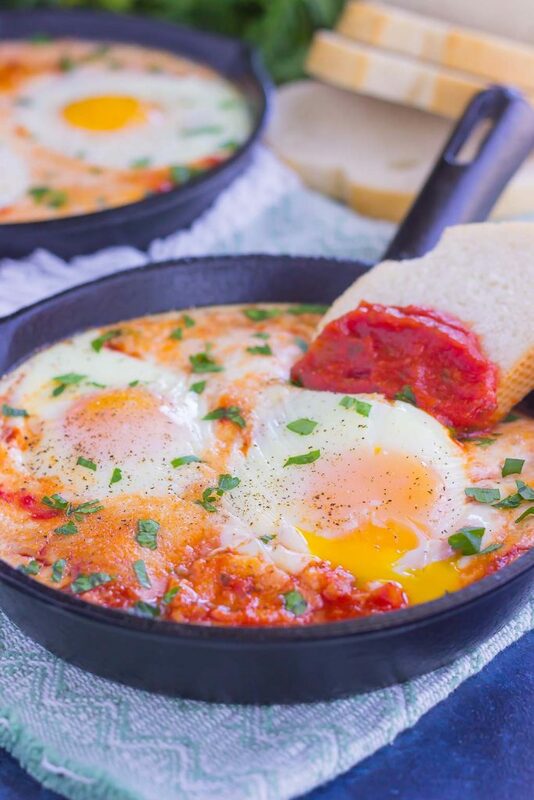 Whether it’s breakfast, lunch or dinner that you’re on the hunt for, these Marinara Baked Eggs will hit the spot and keep you coming back for more! Preheat oven to 400F. Line a medium baking pan with aluminum foil and set aside. Pour marinara sauce into one 9-inch cast iron skillet or two 5 inch cast iron skillets and spread evenly with a spoon. Sprinkle garlic powder over marinara sauce and then top with mozzarella and Parmesan cheeses. Crack eggs into skillet(s) and season with salt and pepper. Place skillet(s) onto prepared baking pan and bake for 13-16 minutes, or until whites are set. Remove from oven and garnish with parsley, if desired. One of my favorite meals! So pleasing to eat and to look at! Your video is beautiful! Love the tune, too! 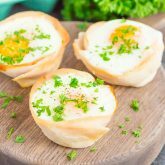 Those runny yolks look like baked egg perfection! We just had "breakfast for dinner" last night, and this looks like another great option. So easy and so flavorful! Thanks, Blair! I'm a sucker for runny yolks. 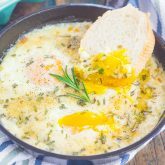 Baked eggs can be so tricky! Thanks for the sweet comment and pin, Dawn! I will have to try that! Thanks, Sarah! You're so right...getting that egg yolk perfect takes patience and you did a phenomenal job! Your video is really great Gayle...I'm impressed you got that egg out easily and that runny yolk just looks incredible! Oh gosh, TIMING! UGH. I never had a problem with timing things until we moved into the new house. The double ovens are super on point, but the gas stove top is like, super charged. Lol. I am having to cook everything on waaaayyyy lower heat. So I feel your pain about timing and getting it right. Looks like you NAILED it with these eggs though! 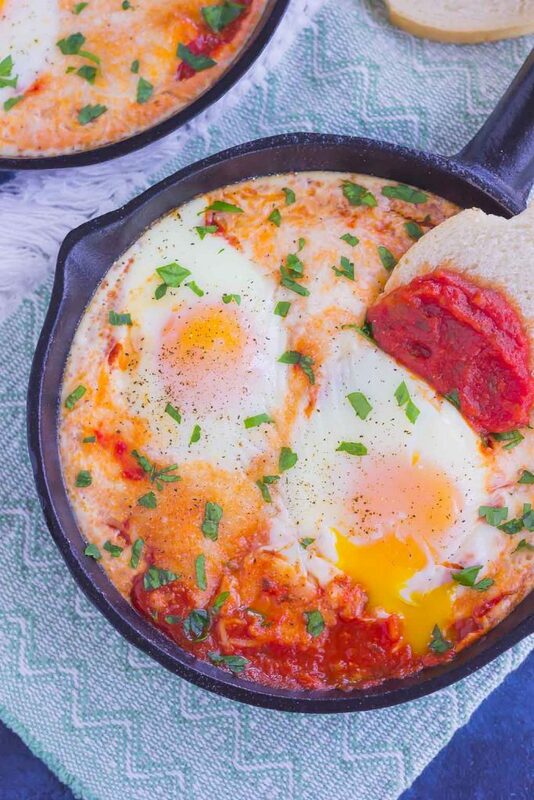 Breakfast is my favorite meal and Shakshouka is one of my favorite breakfasts, so these marinara baked eggs are chanting my name! LOVE LOVE LOVE! Pinned! Cheers, friend! It's so hard to adjust to new ovens! I had the same problem when we moved into our new house last year. Thanks for the egg love, friend! sounds like the perfect way to begin your day! Thanks, Mira! Timing can be so hard to get just right! These eggs look just scrumptious, Gayle! I love any sort of egg dish. I totally hear you on timing, too. I find baked eggs such a challenge to get them perfect! Thank you, Keri! Eggs can definitely be a challenge!